New! Can be used for directing chords and melodies! This 28" x 28" fabric staff can be held by hand or hung up using the included rope holder. It is an excellent tool for introducing the music staff to young students. 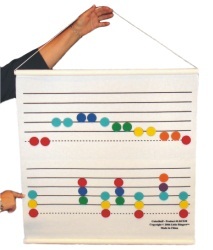 The set includes 96 felt circles which match the colors of the Kidsplay brand handbells and combined handbells/deskbells. Each felt circle has a hook and loop style fastener so it can easily be placed on and removed from the fabric staff. 96 circles are included in all, with 24 red circles to match the C bells and 12 each of the other colors to match the remaining notes of the C major scale. For longer songs, use two ColorStaffs.